I do not bake many desserts, but I do like to have some healthy quick breads or muffins on hand to serve friends or neighbors that may stop by for a coffee. 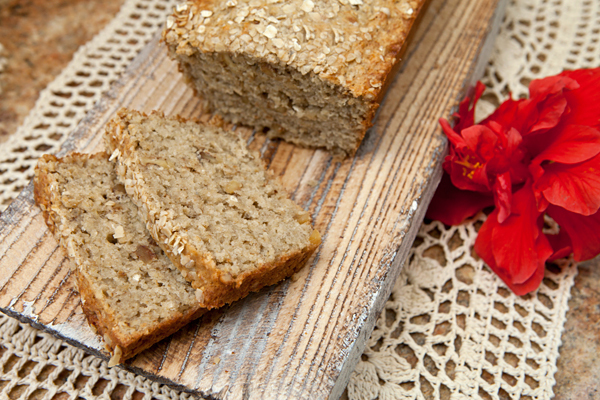 I am enamored lately with oats and oat flour and love both the texture it adds to baked goods, as well as the flavor. Add to that the fact that oats contain a good amount of protein, are high in fiber, and rich in thiamine, folate, B5, iron, magnesium, zinc, copper, and manganese, and I want to add oats to all of my baked goods! 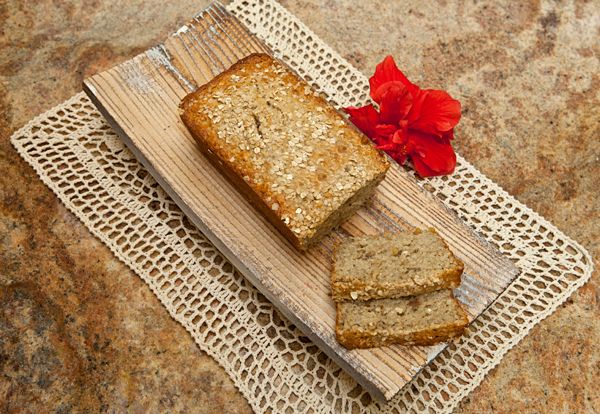 This bread is moist and dense in texture, and the bananas add enough natural sweetness so you do not need much sugar. I kept my loaf simple by adding just chopped walnuts, but you could vary the add-ins by including dried fruit such as cranberries or raisins, coconut, or even chocolate chips. Waluts are a good source of protein and are rich in phytosterols which help to lower cholesterol. 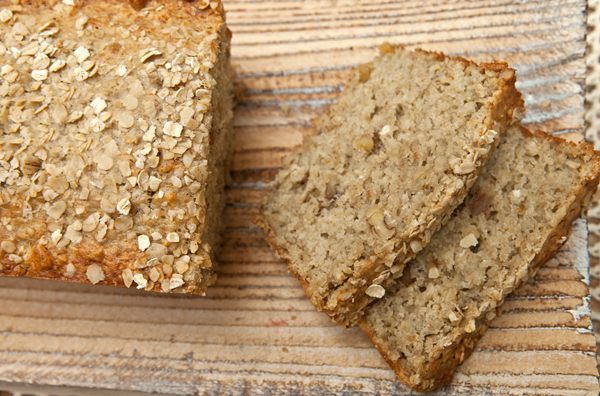 Also rich in fiber and vitamin E.
In one bowl, stir together the flour, oats, baking powder, and salt. In another bowl, whisk together the bananas, coconut oil, eggs, and sugar until blended. Pour the wet ingredients into the dry and stir just until combined. Stir in the chopped walnuts, then pour batter into prepared pan. Brush the loaf with water, then sprinkle the oats on top. Bake for about 45 to 50 minutes, or until a cakes tester inserted into the center comes out clean. Cool in pan for 30 minutes, then turn out onto a wire rack and cool to room temperature before slicing.